I read this article and found it very interesting, thought it might be something for you. The article is called CTA Holds Prayer Service for Self-immolators Yeshi Khando and Ney Kyab and is located at https://tibet.net/2015/04/cta-holds-prayer-service-for-self-immolators-yeshi-khando-and-ney-kyab/. Kasur Kirti Rinpoche at the prayer service for Tibetan self-immolater Yeshi Khando and Ney Kyab, 22 April 2015. 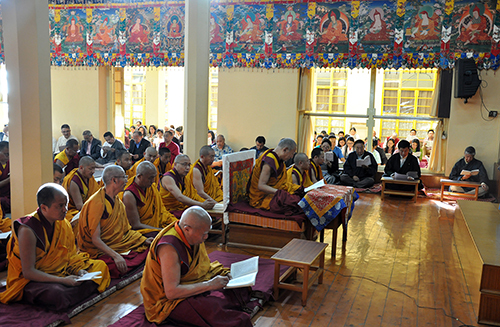 DHARAMSHALA: The Department of Religion and Culture of the Central Tibetan Administration organised a prayer service yesterday for the Tibetan self-immolators, particularly Tibetan nun Yeshi Khando and Ney Kyab, who died after setting themselves on fire in protest against the repressive policies of the Chinese government on 8 and 16 April respectively. The prayer service was attended by members of the Kashag, Tibetan parliamentarians, Tibetan justice commissioners and officials of the Central Tibetan Administration. The local Tibetan community of Dharamshala along with Tibet supporters also came out in large numbers at the prayer service to pray for the deceased self-immolaters. The service was presided over by Kasur Kirti Rinpoche, the head lama of Kirti monasteries. Sikyong Dr. Lobsang Sangay, the democratically elected political leader of the Tibetan people, delivered the condolence remarks of the Kashag. Despite the repeated appeals of the Central Tibetan Administration urging the Tibetan people not to resort to drastic actions, at least 138 Tibetans have set themselves on fire protesting against the repressive polices of the Chinese government since 2009. Out of the 138 Tibetan self-immolaters, 119 have died while the status of the rest remains unknown or critically injured. 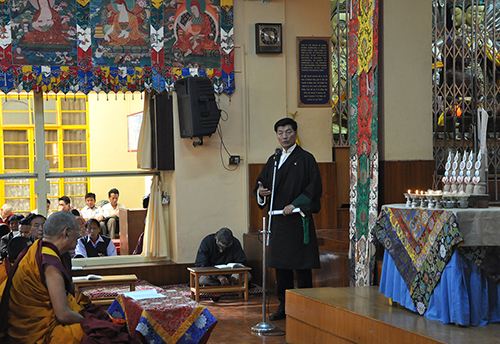 Sikyong Dr. Lobsang Sangay delivering the Kashag’s condolence remarks at the prayer service, 22 April 2015.